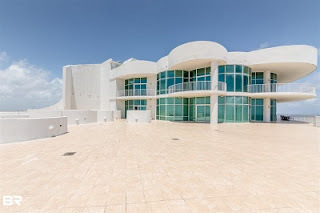 Turquoise Place Resort luxury beachfront condo for sale in Orange Beach AL.This stunning top of the line Turquoise Place Penthouse unit allows you to enjoy paradise without sacrificing luxury. Previously featured in Condo Owner Magazine, this 5700 square foot condo features 5 bedrooms, each with a private bath, large kitchen open to living area, media room and half bath. Enjoy your breathtaking panoramic views of the Gulf beach from your 8,000 sq ft balcony while you sip your morning coffee or enjoy your evening glass of wine. This first class complex features a well-lit parking garage, indoor and outdoor salt water pools, spas, lazy river pool, children's playground, steam and sauna rooms, poolside restaurant and grill and spa services…you have to see this condominium!